I had not planned to go out with the camera on Sunday morning as all my local patches would be flooded and it would be a waste of time.However when I had to nip out to the local shops I decided to have a quick look at the river at Brueton Park to see if it had burst it's banks. The main lake at Brueton Park is not known for getting any decent birds all you normally get are Mallards,BH Gulls and Canada Geese. Brueton Park is only famous because often it records more dogs racing around than you get at Crufts on a busy day. 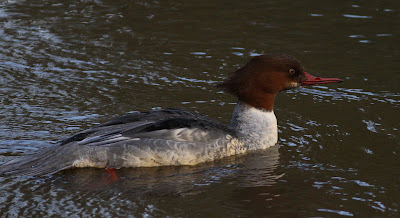 After I had a look at the river racing under the bridge I decided to have a quick walk round the lake.When I got to the top end of the lake I was very surprised to see a lone female Goosander hiding in the gloom of the far bank.A very good bird for Brueton Park. Anyone who knows Brueton Park would know that that end of the lake is very gloomy as it is surrounded by tall trees so to get any shots I had to wind up the ISO pretty high.This Goosander unlike her mates at Shustoke Reservoir and most other places was not shy and was soon cruising round the lake pretty close in. Amazingly my new best friend then decided to tackle the rapids just before the top bridge. 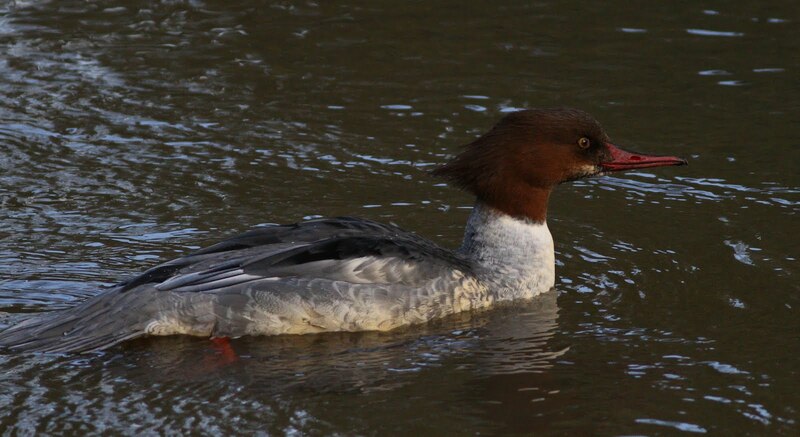 After she got through the rapids she started to fish near the bridge and I managed some more shots.I've never got so close to a Goosander before.She didn't seem to mind about people or dogs. After failing catch any fish it decided to clear off and flew into the distance eastwards. When I found out on Friday morning that it was going to be the last day for a while when it would be "Dry and sunny" I grabbed the camera and set out on a local tour. I headed for Shustoke Reservoir first and as I parked up I encountered my first bit of bad news.The weather was not " Dry and sunny" it was "gloomy and damp" so well done weather man you've done it again. The second bit of bad news was that those pair of miserable Great Northern Divers yet again stayed miles away for me.I am convinced now that they have got it in for me and this was confirmed later on when one of them gave me a wing flap which is the equivalent in the GN Diver world as the finger.I'll get them though !!! Luckily for me there were at least 15 Goosanders on the water. However it was the Goosanders that delivered the third bit of bad news.They also spent most of the time way out from the shore well out of range of my lens and when they did venture in they spotted me as I crept towards them and headed out again.Being spotted was a big surprise for me as my camo gear and fieldcraft skills are legendary often when I'm walking round reserves people I know well will walk straight past me not knowing I'm there.Well I think they don't. Did manage some flight shots which aren't too bad considering it was so gloomy. I gave up not long after 11.00 AM and set off to Marsh Lane. By the time I entered the Oak hide it was at last beginning to brighten up but the railway pool was very flooded with the water not far from the hide.With rain forecast for the next few days I can only see things getting worse and this hide may be cut off. There was very little around with most of the islands under water but I did spot the Jack Snipe hiding away in the reeds in the flooded marsh area.The trouble was in the hour I was there it didn't move more than 10 centimetres. I was lucky when I spotted a Tree Sparrow on the Oak feeders.First I'd seen for a couple of years. Chasing the G.N.Divers again at Shustoke. Two friends at Marsh Lane on Sunday morning told me that last week that they had both got one of the Great Northern Divers at Shustoke Reservoir close in by the disabled car park so on Monday morning I thought I'd better get over there and get some shots. Got there at 10.30 AM to find a sunny morning.It took me ages to find the GND's mainly because they were miles away.Oh Dear !!!! 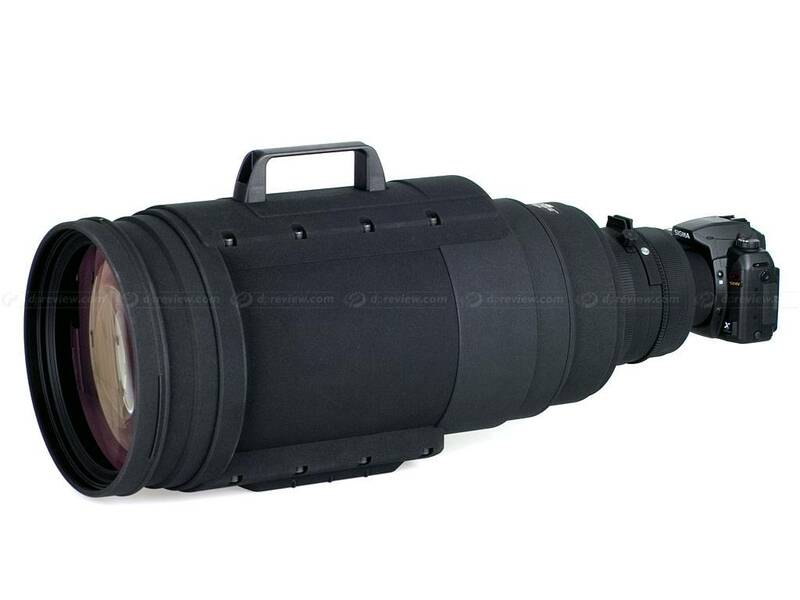 I'd have to wait with fingers crossed hoping that they would come closer. All was not lost because I found 3 Goosanders just beyond the jetty.They didn't pay ball either and refused to come close all morning here is the best I could get heavily cropped . After 2 hours of waiting for the GND's to come in closer and failing badly because they stubbornly stayed in the middle.This is all I got which is much worse then the last two visits. To prove I can get shots of these chaps here are two I took earlier.Much earlier in fact November 2008 at Draycote Water when it was a great winter birding spot. It's obvious that my kit is not up to getting decent shots at range so I may upgrade to this set up but I will need a porter to carry it for me. Two trips out but little to show. Went to Brandon Marsh on Saturday morning but it turned out to be a bit of a mistake and I hardly used the camera at all as there was very little around some of the ponds having no birds on show at all. Did manage some shots of a Kingfisher that showed very briefly from the Carlton hide which was the first one I'd seen for ages. The only other bird I found all morning was a Song Thrush and that was it.It was a good job the pretty waitress in the cafe was on duty and looking good because otherwise it was a poor morning's birding. Popped over to Marsh Lane early this morning.There were loads of Geese,Ducks,Gulls etc. on show but nothing of note so no pics. Off to Marsh Lane in freezing weather. Even with the temperature still only at -3C I layered up on Thursday morning and paid a visit to Marsh Lane.I got there just before 10.00 AM to find it sunny but bitterly cold. There were loads of Reed Buntings and Yellowhammers on the fencing as I headed to the Car Park hide but not surprisingly I found the water frozen with nothing showing. As I headed to the Oak hide I met up with Tony the only other birder foolish to venture out in these conditions.There was frost showing on the inside of the Oak hide so as expected the Railway Pool was frozen except for a small area near the gravel bar.The marsh area had some open water and several Common Snipe were enjoying themselves there. A big bonus was when a Water Rail made a very brief appearance before scuttling off back into the reeds.First one I'd seen for ages. Tony had spotted a Jack Snipe in the marsh but was well hidden and unwilling to move. After nearly an hour waiting the Jack Snipe showed some signs of moving but one of the gang Moorhen thugs that had turned up chased it off and all I got was a shot of it being scared off and scurrying off into the undergrowth. On the way back to the car park on the causeway I had a go at getting some seasonal shots. As I headed back to the car park I met up with John Oates who told me about his recent trip to Suffolk to get the Hornemanns Redpoll which I didn't realise was such a rarity in England.By this time with the sun having disappeared my thermals had been penetrated and I was very cold but managed to get a crappograph of one of the Bramblings that John had spotted amongst the huge mixed flock on the crop field. A Jay in the garden. There are three common birds that I struggle to get decent shots of and these are Jays,Green Woodpeckers and Common Buzzards.They all spot me miles away and fly off to the next county.I did OK with a Common Buzzard earlier in the week and got some half decent shots of one perched (see last post) and today I did OK with a Jay. It was about 9.00 AM and I was scanning my own and my neighbour's garden for Lesser Redpolls that had visited recently but was struggling to see much in the misty conditions when suddenly a Jay landed on my garden fence.I was lucky to rattle off a few shots before it flew off.Not a bad spot for a small suburban garden.